In an island nation where dial-up is just starting to be introduced, your 2018 digitally dependent self has to know what essential apps for Cuba. As you might know, data really doesn’t exist in Cuba yet but WiFi does exist in public parks and hotels. See my guide to learn how to get on the internet in Cuba. That doesn’t really help when you’re walking around La Habana or going to Trinidad or on the beach in Varadero now does it? You’ll need to download applications that run while being offline. Luckily for you, there are a few essential apps for Cuba and even some developed in Cuba by Cubans (years! tech start-ups are a thing in Havana!). If there is any app you need to download for your trip to Cuba, its this one. Maps.me allows users GPS without being connected to the Internet. Maps.me isn’t just your normal offline map, its pretty accurate with up-to-date information on where bars, restaurants and attractions are. To get the map of Cuba, after you download the app you must go in, zoom into Cuba and download the map of Cuba. A La Mesa is yelp a lo Cubano, kind-of. It lists all the restaurants in specific cities, their prices, and their contact information. Developed in Havana, a La Mesa is one of the first Cuban made apps. IMO is Cuba’s Skype. Seriously, if you’ve been to Miami or know any Cuban-Americans you probably know its ringtone. I swear, it haunts me. But IMO is awesome to have to video chat your friends and family back home. Its much more reliable than Facebook Messenger video or WhatsApp. To use IMO, make sure your loved ones also have it. Once you enter their numbers in your contact list, they should pop up. That easy! I think this is a pretty much no-brainer if you don’t speak fluent Spanish just make sure you download the Spanish dictionary before your flight to Cuba. But don’t rely to heavily on Google Translate for everything. Cubans have our own unique way of speaking eloquently. Want to share a photo with your new Cuban friend? Or perhaps get that cool reggaeton song they have? Alas, Zapya. Cuba’s version of hacking the capabilities of sharing the internet without being on it. Zapya allows you to connect remotely and internet-freely other devices around you using Bluetooth system. Its like Airdrop for Apple but works between any system! It’s a great way to share anything from device to device. 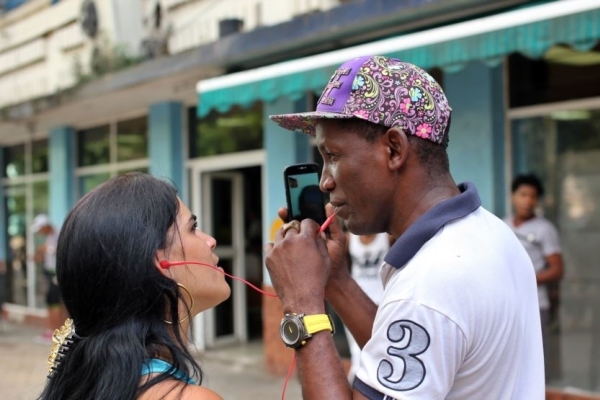 As the internet is slowly penetrating Cuba, change is happening both socially and politically. More Cubans can see how people live outside. With apps like IMO, we can now connect with your family members everyday if we wanted to. The emotional farewells at Jose Marti are softened now knowing you can see your loved one in just a few hours. All this being said, apps bring the once isolated nation a little closer to 2018.